Who wants to create a cleaning schedule? If your house always feels like it is a mess, perhaps you do. The reason is that it is much easier to tackle tasks with a schedule for cleaning your home than to have them pile up, at least where possible. But if the thought of creating a housekeeping schedule, be it a daily, weekly, quarterly or seaonal schedule, makes you think, why bother?, then read on. Below is my countdown of the top ten reasons I believe each busy household will benefit from a cleaning schedule. 10. Making a home cleaning schedule gives you the time to sit down and really prioritize what needs to be cleaned. 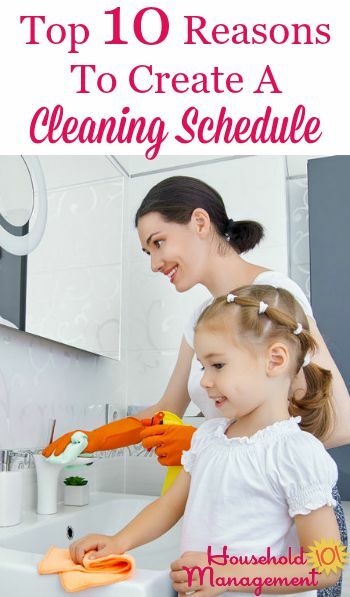 A schedule for cleaning house is not, in my opinion, a good idea because it will allow you to clean the grout in your bathroom once a week with a toothbrush. In fact, drudgery tasks are not on my own regular cleaning schedule. Why not? Because it isn't a priority to me. The important stuff to be cleaned even when you don't have time for anything else, is the things you really use, like your toilet, shower, kitchen, bed sheets, etc., not the grimy mirror in the hall. Your cleaning schedule should be short enough to allow you to actually accomplish it, and make it hit all the spots that really need it, and that you will feel the most positive effect from cleaning. 9. 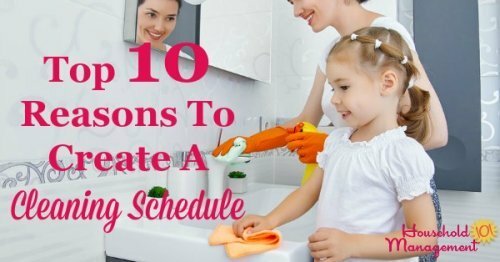 A written schedule allows everyone in the home to be assigned a task or two, and participate in the cleaning. Have you ever has this thought? "Why do I feel like I am the only one in this house who does any cleaning?" I think this thought is pretty common, and I know I have experienced it myself. "Why does it seem I am the only one who can 'see' what needs to be cleaned, while everyone else ignores it?" Well, creating a cleaning schedule on paper, that you put in your household notebook, can go a long way toward solving these problems, and keeping you from having these thoughts and questions. Once a schedule is in place everyone knows the expectations, and can then be of some (or a lot) of assistance to you in keeping your home clean. 8. You won't have to do anymore marathon cleaning sessions. We've all been there -- the house has become a total disaster area, and you can't stand it anymore, so you have decided to devote your entire free day off to cleaning the house. By the end of the day (or sooner) you are exhausted, cranky, and feel like you still have a long way to go, but quit, collapsing on the couch vowing not to clean again for a good long while. If you follow a schedule for cleaning your home you will only do a little at a time, but it will all get done and you won't have to spend a perfectly good day working yourself too hard cleaning the house in one big burst. 7. You won't have to do a mad dash when visitors come unexpectedly, or feel embarassed if they see your home without warning. When your home is not cleaned frequently another problem we encounter is the mad dash to clean up the house when company is coming. I think we've all been the one running around like a crazy person when a visitor says they're coming over in just a few minutes. It's even worse when they come without any warning at all, and see your house in its "natural state," which is not one you are too proud of. Following a cleaning schedule will never mean that you will be 100% ready for company at all times with a tray of warm cookies straight from the oven waiting to greet your unexpected guest. Schedules for cleaning house help out, but they don't make miracles. But, when you follow a schedule you won't have to be embarrased when people come over unexpectedly, and you will have time to actually enjoy their company instead of being agitated about the mess around you. 6. Everything in your home will stay at least reasonably clean most of the time. Has something in your home ever gotten so incredibly filthy it was almost unsalvageable, or took an incredibly long time to get it clean again? Cleaning schedules, when followed, make this a thing of the past. Assuming you have scheduled the main stuff into your cleaning schedule for some regular interval (even if that it just once a year for some things), then nothing will get so far gone that it is just disgusting. 5. Home cleaning schedules, when followed, will allow your home to be more comfortable for all family members. Since most things are reasonably clean most of the time you and your family will enjoy being at home more, because everyone will feel more comfortable. When things are basically clean and orderly (not necessarily rigidly spotless, where you can't put your feet up and relax) everyone is able to feel more at ease. This helps makes your home a haven for you and your family, which is one of the main goals of household management. 4. Safety in your home will also be increased, with less junk and clutter laying around. Another by product of things being reasonably clean and orderly in your home most of the time is that it increases the safety of your home. In a clean home you are less likely to trip and fall on clutter, for a pretty obvious example. But an often overlooked example is that regularly cleaned and disinfected bathroom and kitchen helps prevent the spread of germs which can make your family ill.
Having your home cleaned regulary keeps it both safer from accidents, but also a healthier place for your family to live. 3. You become proactive, instead of reactive. Have you ever felt like all you do all day in your home is "put out fires?" I don't mean literal fires, of course, but you just feel like you run from one emergency to the next, never getting to the things you really planned to do that day? For example, you realize at breakfast that you need to run to the store because you are out of milk, and then wash the uniform that needs to be worn to work in five minutes, so you end up telling the kids to eat cereal with water and wearing a stained shirt to work? When following your cleaning schedule you will never have to hear, "Mom, I don't have any clean underwear," or "Mom, I can't find my ______ (fill in the blank)," right before you need to rush out the door. Cleaning as you go, and on a routine basis, means that less preventable crises occur in your home -- like I forgot to wash the soccer uniform for today's game, for example. 2. A housekeeping schedule allows you to enjoy your home and family without worrying that you should be cleaning right then. 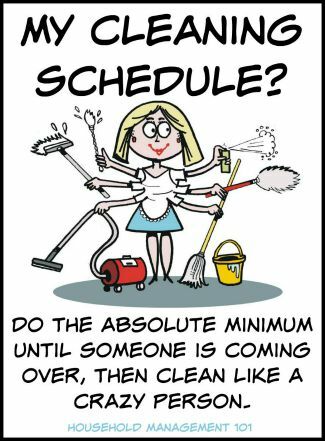 You might think that if you created a cleaning schedule you would feel like you had to clean all the time, so you don't want to do make a schedule that will just make you feel oppressed. I can understand that fear, but I will say that exactly the opposite happened for me when I created and began to follow a schedule for cleaning my home. Instead of every moment thinking, "I need to be cleaning," I could instead get the cleaning done and play with the kids without guilt, or even clean later, because I knew I had time to relax right now. Creating a cleaning schedule actually made me feel more free, not less. 1. A schedule for cleaning house allows you to get the housework done, and then have more fun! No one wants to clean their home all day every day. Cleaning your home is just a means to an end -- to be able to have a nice place to live and relax, and to make sure you take care of your family's needs. Therefore, following a cleaning schedule allows you to accomplish those end results and then get on to what you really want to do -- have fun! 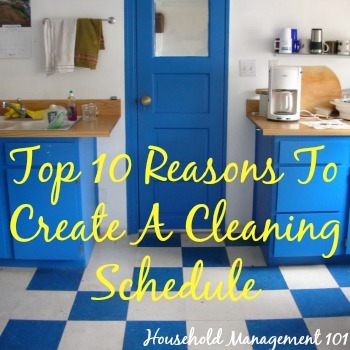 I hope I have at least given you some good reasons for creating a cleaning schedule for your home. You may also find these cleaning checklists helpful to give you some ideas about what types of things need to be cleaned in your home, and at what frequency.